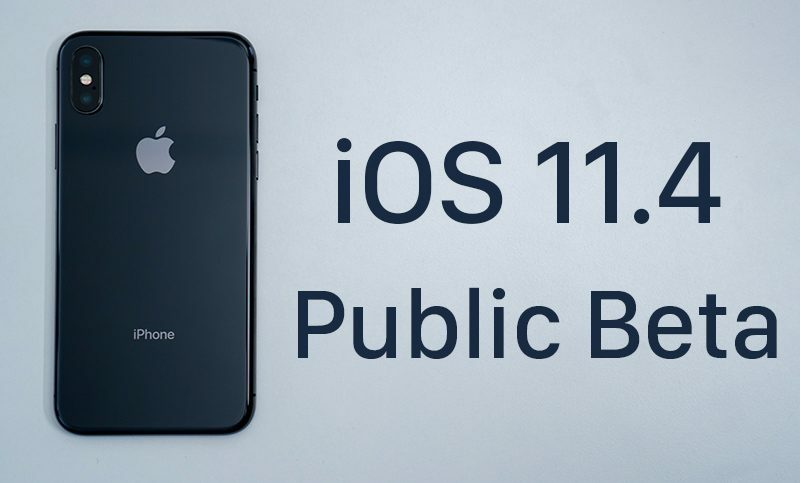 Apple today seeded the first beta of an upcoming iOS 11.4 update to its public beta testing group, one day after seeding the beta to developers and a little under a week after releasing iOS 11.3, the last major update to the iOS 11 operating system. Beta testers who are members of Apple's beta testing program will receive the iOS 11.3 beta update over-the-air after installing the proper certificate on an iOS device. iOS 11.4 is going to look a lot like iOS 11.3 because several features that were removed from iOS 11.3 ahead of its release have been re-introduced in iOS 11.4. The update includes support for AirPlay 2 features, allowing you to play the same song on multiple devices and adding the Apple TV to the Home app, plus it offers Messages on iCloud. Messages on iCloud was present throughout the iOS 11.3 beta testing period, but it did not make it into release. The feature is designed to let you store your iMessages in iCloud, syncing them across devices and saving valuable storage space. Stereo sound in HomePod is also an available feature, but it is not functional at this time as Apple has not provided the 11.4 HomePod software to developers or public beta testers. When I used to install the betas, I'd call Apple with a technical question about my iPhone (under AppleCare warranty) and the person on the other end would say that since I installed the beta they couldn't help me (regardless of the problem). I would first have to reinstall the last sanctioned OS. Basically, once I installed the beta, any problem with my phone was MY problem, not theirs. You're looking at it from a skewed point of view. If the beta is possibly causing the issue then it makes perfect sense for them to ask you during troubleshooting to revert to a non-beta release to diagnose it. Hardware is still perfectly under warranty. When my touchscreen died they didn't require me to revert it to a stable release. It was a known issue and they swapped my iPhone out immediately. Someone let me know how it is... finally have a somewhat stable iOS with 11.3 and dont wanna run into more stupid issues. that said, if you are afraid of bugs, you should also stay with the latest public release. I enjoyed checking out the betas until I discovered Apple basically invalidates AppleCare if you install one. I don't understand their reasoning, but I guess I'll just wait for the official releases. How come? Mind developing this a bit further? I’ve never had this problem and I use betas since the very beginning of the public beta program. Apple TV on the Home app? I've been wary of breaking existing software, but even more so, it just didn't seem worth it (even though they're all free updates) since many of the features were only applicable to Iphones (vs. Ipod Touches), while I'm not sure many of the updates will be really applicable for an Ipad 4 generations old. Well, hopefully you aren't doing any personal banking or keeping any other sensitive information on those old devices then - because there have been some major security holes discovered in iOS since the iOS 7 days. So, I wonder what’s changed beyond AirPlay 2 and iCloud Messages. Ive never had an issue with apple care and betas... they've always honored it.. I guess it could be a "Public Beta" thing, as it makes no sense for them to invalidate Apple Care for Developers when we're urged to update, so that we can make sure our programs are compatible in time for the next release. For the public it's not really an urging, it's more like "try it out if you'd like, at your own peril" kind of thing. But for some reason it doesn't seem like they'd do that to public beta users. I’m a public beta user and have never had an issue with AppleCare or out of warranty work when using a public iOS beta. Will installing public beta software from the Apple Beta Software Program void my hardware warranty?